An exhibition at LACMA reveals the art and history of the ancient Mexican city of Teotihuacan. Tripod Vessel with Goggle-Eyed Figure, 450–550, Teotihuacan, Ceramic with post-fire stucco and pigments, 14.3 x 14.9 cm. Mask, 300–600, Listwanite (serpentinite), 22.5 x 28 x 12 cm. Standing Figure, Tlalocan [tunnel under Feathered Serpent Pyramid], Teotihuacan, Mexico, 200–250, Greenstone, 47 x 19 cm. Feathered Serpent Eccentric (1 of 18 eccentrics), Moon Pyramid Burial 6, Teotihuacan, Mexico, 200–250, Obsidian, 6.7 x 38.4 x 1.6 cm. About 25 miles northeast of Mexico City lies the site of Teotihuacan, an ancient city that flourished from around 100 B.C. to 550 A.D. and was once the largest in the Americas and the sixth-largest in the entire world, with a population as high as 250,000. Dominated by two massive, stepped pyramids, the Pyramid of the Sun and the Pyramid of the Moon, the nine-square-mile city was laid out on a grid structure and boasted the world’s first apartment-housing complexes. Later Mesoamerican cultures were fascinated by Teotihuacan; the Aztecs looked to it for inspiration, considering it to be the locale of their creation myths, “the birthplace of the gods”—which may be the meaning of the word “Teotihuacan” in Nahuatl, the Aztec language. In any case, Teotihuacan cast a very long shadow throughout the region, influencing cultures as far away as Guatemala, the ancient Maya in particular. 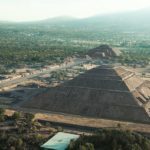 Its origins have long been mysterious, but recent research indicates that Teotihuacan was multi-ethnic, with various populations inhabiting distinct sections of the city. 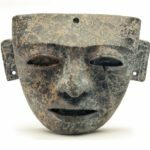 The art of Teotihuacan, on the other hand, was remarkably uniform in style, the most immediately recognizable works being a characteristic type of obsidian mask. 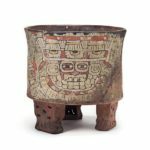 The art, history, and urbanism of Teotihuacan are being presented to the American public in a massive exhibition, “City and Cosmos: The Arts of Teotihuacan,” which runs at the Los Angeles County Museum of Art through July 15. It was previously on view at the de Young Museum of the Fine Arts Museums of San Francisco, which co-organized it with LACMA and Mexico’s Instituto Nacional de Antropología e Historia (INAH). 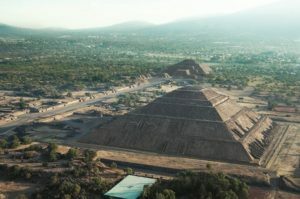 The last major exhibition devoted to Teotihuacan in the U.S. took place in 1993; the current one not only showcases the high spots of the city’s art but reveals what has been discovered in the excavations that have been going on there in the past quarter-century. For example, in 2003 a Mexican team led by archaeologist Sergio Gómez Chávez found a tunnel running under Teotihuacan’s Feathered Serpent Pyramid, its ceiling covered with the mineral magnetite, which conveys the impression of glittering stars in a night sky when light shines on it. This subterranean sector, which is believed to symbolize the sacred underworld, was filled by the people of Teotihuacan with ritual objects, such as rubber balls, pyrite disks, seeds, and feline skulls. 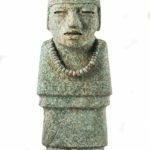 In a chamber at the end of the tunnel were placed four sculptures of precious greenstone that Chávez’s team believe represent the legendary founders of the city and may have been used in divination ceremonies. Two of these hieratic, proudly erect figures are on view at LACMA. The feathered serpent to whom the pyramidal temple was dedicated was a universal figure in Mesoamerican mythologies. The god’s symbolism indicated its dual nature—with its feathers it could fly in the heavens while its serpentine body enabled it to traverse the earth. 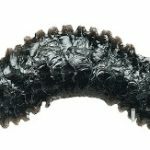 Various kinds of feathered-serpent sculptures have been found at Teotihuacan; for example, a three-inch-long undulating snake carved so that its exterior bristles with feathers, is one of 18 small obsidian objects that were placed together in the Moon Pyramid (18 being a significant number in Mesoamerican calendrical schemes). 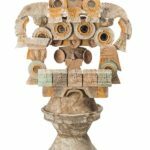 Most of the objects on view in the LACMA show—including mural fragments with a characteristic rich, pinkish red, as well as the carved-stone works—are amazingly well-preserved. However, a large standing marble figure, found in Teotihuacan’s Xalla Compound, which may have been the site of elite artists’ studios, was deliberately smashed. One of the largest precious-stone pieces from Teotihuacan, the sculpture may represent a deity. While archaeologists are not certain, it is considered likely that the destruction of artworks in Teotihuacan took place around the time the city was abandoned following some cataclysmic event or sequence of events. We know that around 550 A.D., the ceremonial center of the city was burned; the fire was probably set by the inhabitants. What else occurred to bring about the sudden collapse of a seven-century-old civilization is not known, but the most likely candidates are soil exhaustion and climate change rather than invasion from the outside. The gods may have been born in Teotihuacan, but they did not die there. They migrated and settled elsewhere in Mexico and beyond, bringing culture and art with them.